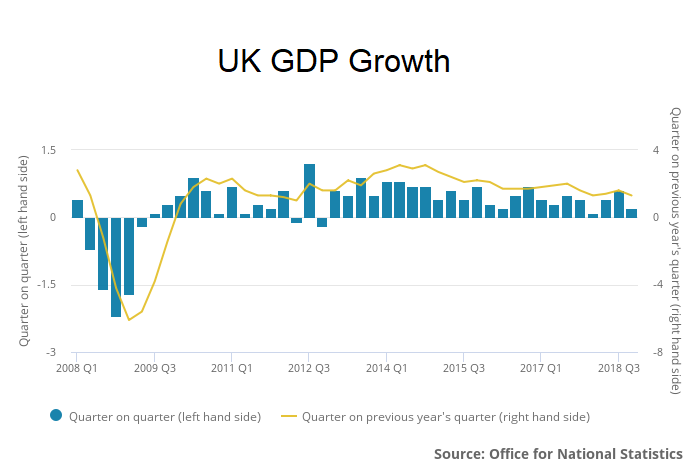 · UK gross domestic product (GDP) in volume terms was estimated to have increased by 0.2% between Q3 2018 and Q4 2018. Q3 2018 growth was 0.6%. · Compared with Q4 2017, the UK economy is estimated to have grown by 1.3% in Q4 2018. · In the output approach to measuring GDP, growth in the quarter was driven by professional, scientific, administration and support services within the services sector, while production and construction both contributed negatively to GDP growth. · In the expenditure approach to measuring GDP, private consumption and government consumption contributed positively, while gross capital formation and net trade contributed negatively to GDP growth. · In Q4 2018, Services output grew 0.4%, Production output fell by 1.1% (its largest decline since Q4 2012), manufacturing output fell 0.9% and Construction output fell by 0.3%. · Manufacturing output of transport equipment fell 2.7%, in part reflecting the partial closures of multiple car manufacturing plants. · Household consumption increased by 0.4% in Q4 2018, broadly in line with the subdued quarterly growth rate experienced over 2017 and 2018. · Government consumption increased by 1.4% in Q4 2018, primarily reflecting an increase across general public services and defence spending. · 2018 GDP growth was estimated to be 1.4% down from 1.8% in 2017. · 2018 GDP growth was slowest since 2012. · Business investment decreased by 1.4% in Q4 2018, the fourth consecutive quarter in which there has been a decrease in growth. 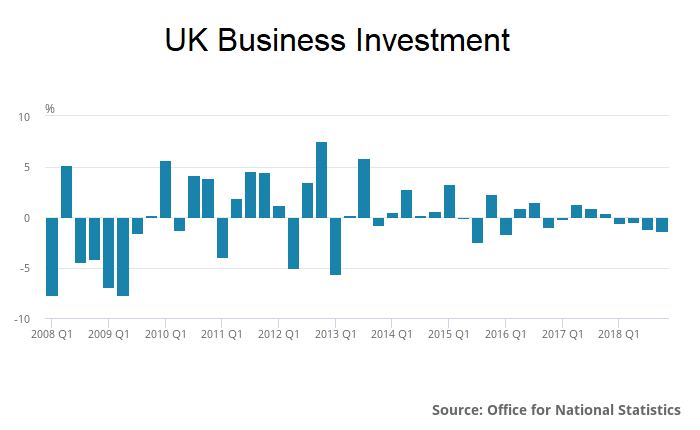 Business investment contracted by 0.9% in 2018.